Total sales of top 10 selling scooters declined by 14% during Feb 2019. Scooter sales through the month of February 2019 remained subdued. High insurance premiums, GST at 28 percent, increased prices in view of safety and engine updates saw many buyers postponing purchase of two wheelers which led to negative growth all across the two wheeler market in the country. Taking into account the top 10 scooters sold in India over the past month saw the Honda Activa in the lead with 2,05,239 units sold. Activa held on to this position despite sales dipping from 2,47,377 units sold in the same month of the previous year. The company now gears up for the launch of the Activa 6G, the sixth gen automatic scooter, which has undergone many feature as well as mechanical changes, with launch date set for later this year. At No. 2 on the list was the TVS Jupiter, with sale of 48,688 units in the past month. 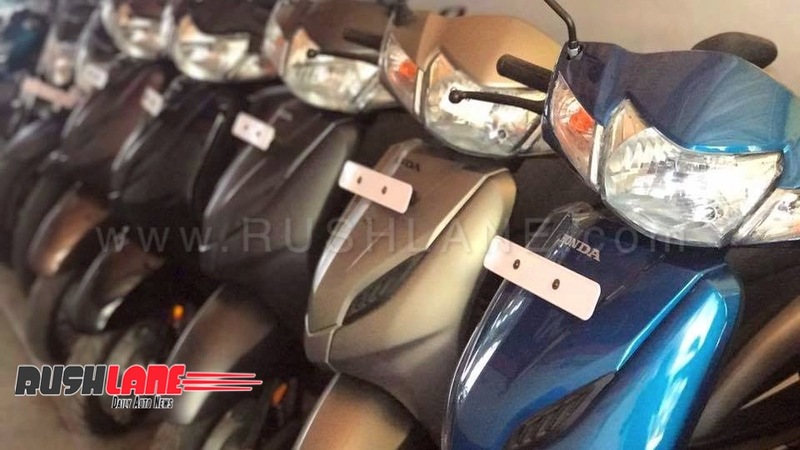 This scooter also retained its second spot on the list as was seen on February 2018 when 63,534 units were sold. TVS Jupiter is a 110cc scooter which follows the same design formula set by the Honda Activa and is marketed as a unisex scooter because of its simple and sleek design. Suzuki Access at No. 3 saw sales to the extent of 48,265 units in February 2019 having jumped position from No. 4 in February 2018 when a total of 39,061 units were sold. Suzuki Access 125 was the second best selling scooter in India in January 2019 beating TVS Jupiter with 54,524 units sold as against Jupiter sales of 51,300 units in January 2018 but TVS Jupiter claimed back its position in February pushing the Access to third place. Honda Dio, which was at No.3 in February 2018 with 41,556 units sold, dipped to a No.4 spot in February 2019 even though sales increased to 45,017 units. The Dio finds favor among a younger segment of buyers and mostly among college goers in states such as Jharkhand, Karnataka and Maharashtra. 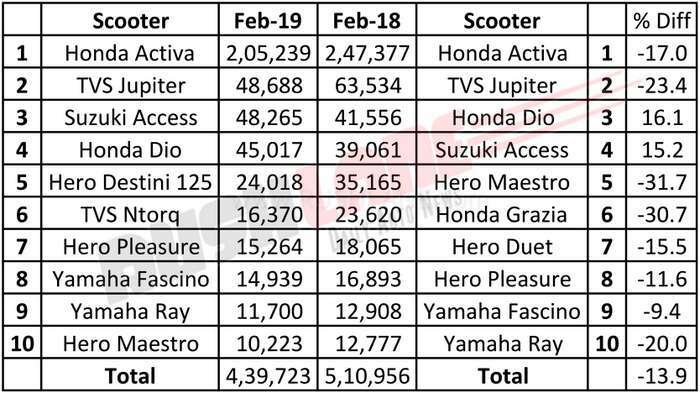 Hero Destini 125 made its way into the list of top 10 selling scooters in February 2019 with 24,018 units sold during the past month. Its competitive price in a sub Rs.55,000 range makes it a strong contender in its 125 cc segment. At No. 6 on the list of the TVS NTorq with 16,370 units sold. This scooter has amassed sales of over 1 lakh units within 6 months of launch with its punchier engine and five attractive colors of red, white, yellow, grey and blue drawing the attention of a younger and more adventurous segment of buyers. Hero Pleasure gained a position from No. 8 in February 2018 to No. 7 in the past month even though sales number dipped to 15,264 units sold as against 16,893 units sold in February 2018. The Pleasure is preferred by female buyers in the country and a facelift version is in the making, due for launch sometime in April 2019. At Nos. 8 and 9 were the Yamaha Fascino and Ray scooters of which 14,939 units and 11,700 units were sold respectively in the past month. Both these models not only noted upward movement on the list from Nos. 9 and 10 in February 2018 but also saw increased sales as against 12,908 and 12,777 units respectively in the same month of the year ago period. Hero Maestro was at No. 10 in February 2019 with 10,223 units sold, dropping five spots from No. 5 in February 2018 when 35,165 units were sold. Hero Maestro edge 125 is also being readied for launch later this month with better features, increased on-board technology and a new engine lineup while it will go against the likes of the TVS Ntorq 125, Honda Grazia and Suzuki Burgman Street.